The Chococlock will definitely be a firm favorite with chocolate lovers, as it functions just like how a cuckoo clock does, opening up its doors to serve up a piece of chocolate each hour. This stylish retro-modern timepiece is a bit like a cuckoo clock but when its shutters open, on the hour every hour, it delivers a scrumptious chocolate treat to the tune of the ‘Dance of the Sugar Plum Fairy’. You then have 30 seconds to retrieve your reward before the clock snatches it back. Loo break? Forget it. An ideal gift for the chocoholic with everything, the Chococlock is bound to become a must-have accessory for executive diet-dodgers everywhere. Simply fill it with your favorite bite-size sweeties (Maltesers, Revels, Minstrels, M&Ms) and wait for the big hand to reach that magical number twelve. As with many other things in life, rules can be bent, and the same applies to the Chococlock. This nifty timekeeper comes with a cheat button that delivers a treat whenever you press it. 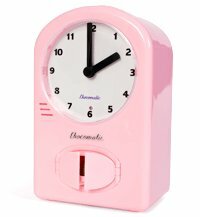 The Chococlock can hold around 30 pieces of small chocolates, and the fact that it comes in pink only would mean the female demographic is the primary target. Surprise your secretary today with this £19.95 gift.